How do you pack dozens of vintage amps and speaker cabinets in a 130 ft² home studio for less than $500? 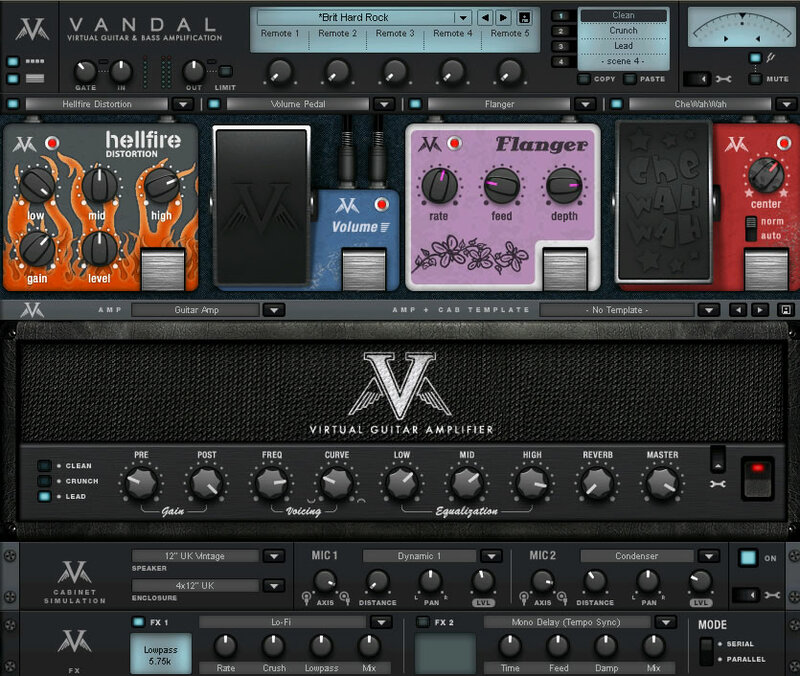 Just enter the wonderful virtual realm with this article about the best commercial software guitar amps. Let's rock! 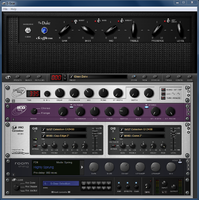 According to a member survey we carried out right here on AudioFanzine, these are the best software guitar amps currently available (bass amps and freeware tools excluded, since they will be ranked in another article). 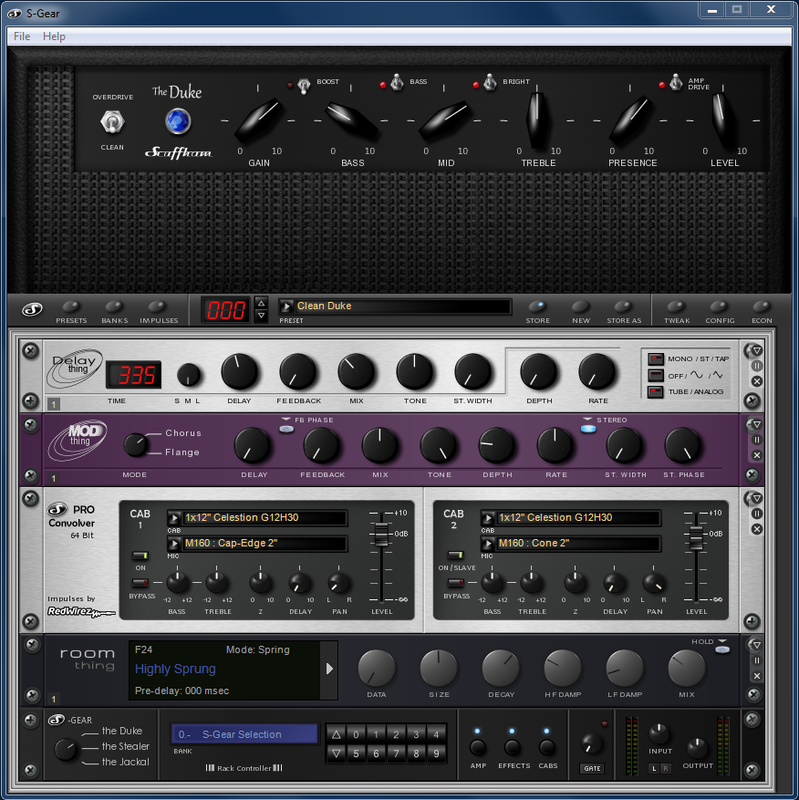 Inspired by the rack concept of the first ReValver version but adding a myriad of effects, modules and routing options (you can split the signal endlessly), Guitar Rig is certainly one of the most powerful software amps on the market. With the ability to produce every imaginable sound, from the most simple to the most complex, Guitar Rig is a real delight for sound designers. But its other great asset is the control room section where you can mix the sound captured by several microphones, exactly like in a real studio. We would like to see this feature in all products because it allows the user to shape any guitar track easily. Its only defect is that while this wild beast will surely entertain sound engineers and demanding guitar players alike, it will discourage users who just want a pedalboard+amp setup in their computer. The price is definitely a big pro. 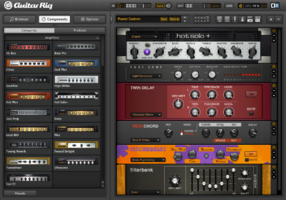 Even if Guitar Rig is not what we would call affordable when bought alone, it is included in the Komplete bundle, which offers an unbeatable value for money, and this is a huge advantage over competitors. 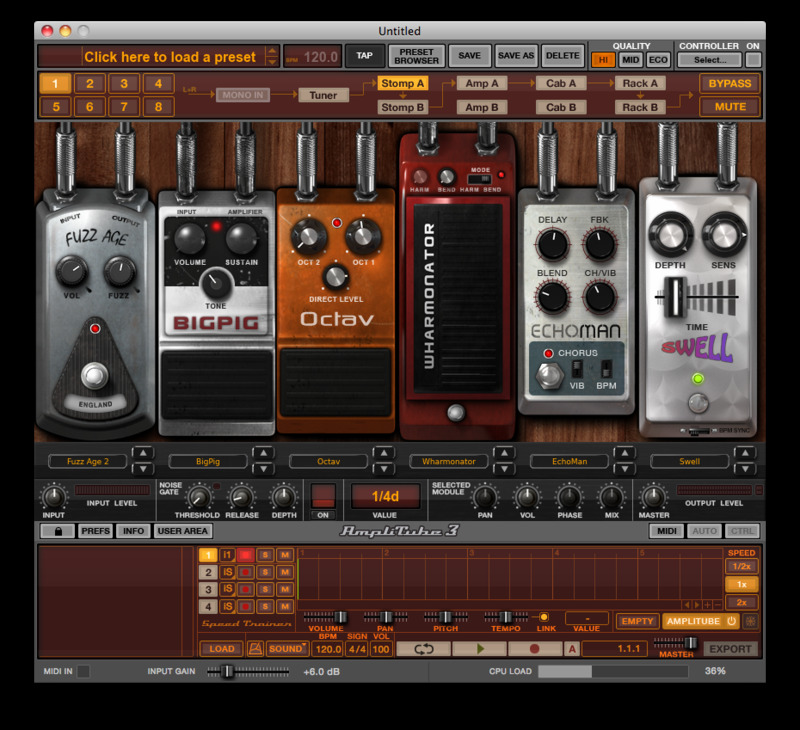 AmpliTube is one of the oldest amp simulations on the market. 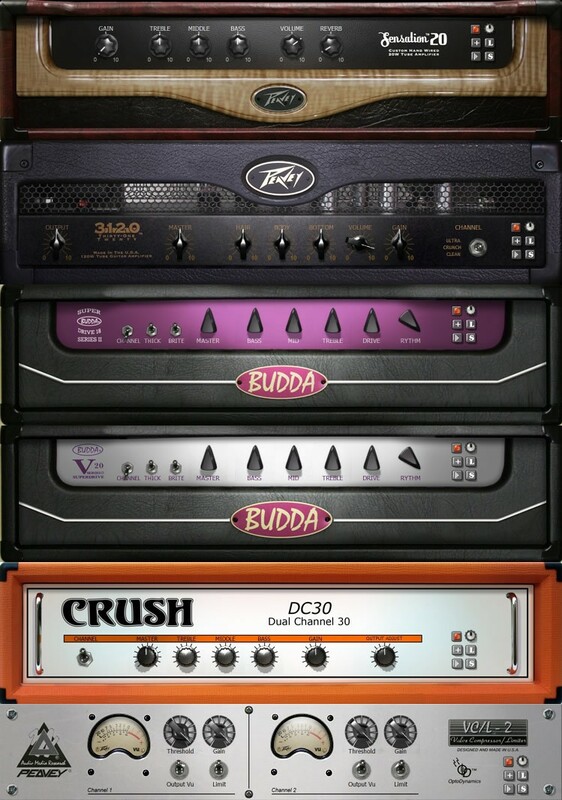 It has been improved year after year and is now available in many thematic or endorsed versions: Metal, Fender, Jimi Hendrix, Slash, plus the generic AmpliTube 3 and the in-app purchasable AmpliTube Custom Shop. 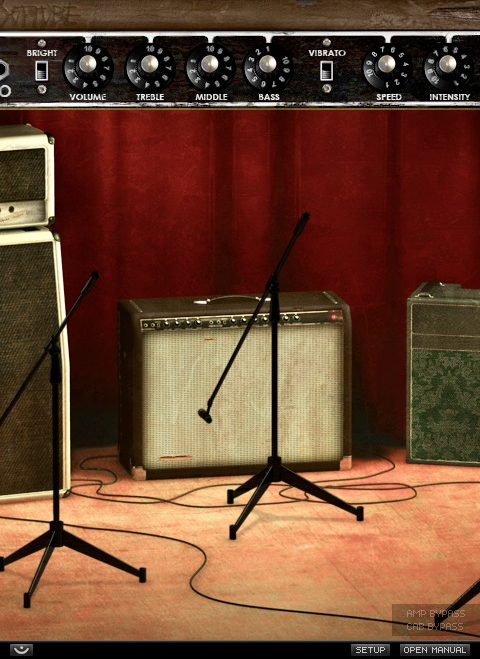 The photo-realistic and intuitive GUI will be familiar to all guitar players: on one side, you get a stompbox rig and on the other an amp + speaker cabinet collection. The sound of both amps and effects is good (very nice Leslie) and IK Multimedia's numerous special offers allow you to buy tools from the AmpliTube series at special prices. 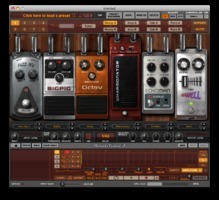 Last but not least, note that AmpliTube products have been ported to the iPhone/iPad platform, where they become real multitrack recorders for guitar players via the in-app purchase system. With a very realistic GUI that provides a global view of the rig and the possibility to zoom into each element to access its settings, Overloud's TH2 and its small sibling TH1 are distant descendants of the Simulanalog Guitare Suite. A freeware pack that ridiculed commercial competitors in terms of emulation authenticity. So it's no surprise to us that many guitar players currently consider the TH2 as the most realistic sounding virtual amp on the market. With unofficial emulations of famous Vox, Fender, Marshall, Peavey, MesaBoogie, and Soldano amps, the software also provides many official simulations signed by THD, Randall and Brunetti, plus an impressive stompbox arsenal. Among the special features, note the possibility to morph two amps together (and no, we are not talking about mixing here), which is a very simple and original way to create new amp types. It also features an accurate control of the microphone position (besides the distance, you can set both horizontal and vertical positions as well as the tilting of the mics). In short, an extremely comprehensive software tool that is very easy to use. Also available for iPad via the Auria app. 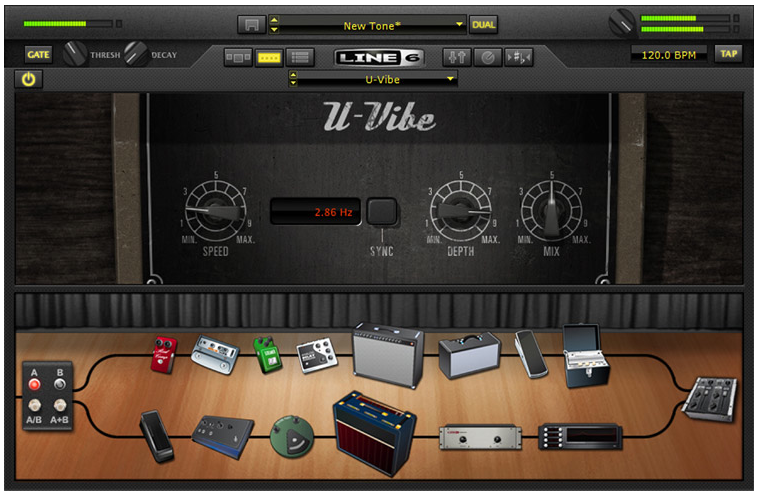 Line 6 has been the leader in terms of digital modelling and marketing for a while (in-app purchasing was already available in Line 6 plug-ins a long time before Apple started to develop the concept), but competitors overtook Line 6 in the software market. However, the POD Farm is still very pertinent in terms of ease of use and versatility considering the huge number of amps, effects ans speaker cabinets available in the Platinum version — it's a pity that the Particle Verb is not included. In short, a sound choice. 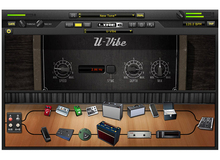 The Eleven Rack is the main competitor of Line 6's POD Pro. And there is also a software version of its excellent simulations and speaker and microphone combinations based on convolution technology. 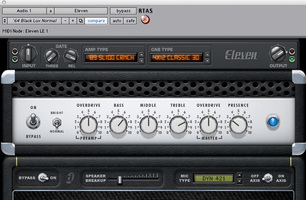 Available in native and AAX versions, but limited to Pro Tools (the sequencer comes with an LE version included), Eleven is very easy to use and rather effective. It has only one big disadvantage: it's very expensive compared to the rest. 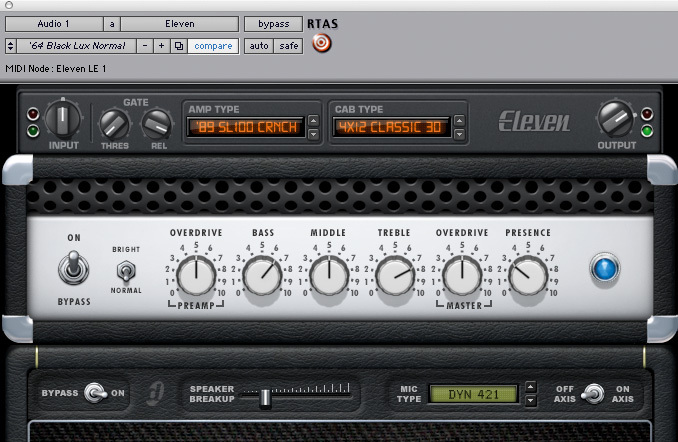 Luckily, Avid often makes special offers and Eleven is often included in bundles or available as a goody. Take advantage of that and buy it discounted. Alien Connection's software – acquired by Peavey – is among the oldest amp simulations and certainly one of the most powerful on the market. 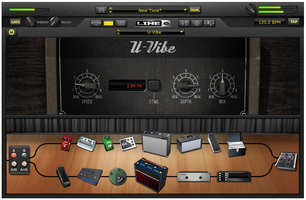 Besides the fact that it offers one of the greatest amp and effect collections available out there — especially considering its exceptional audio quality —, it provides a Tweak mode allowing the user to fine tune all components of an emulation: tube types used in the amp, bias, voltage, resistors, transformer types, feedback loop, etc. And you can also find a lot of parameters in the speaker cabinets. 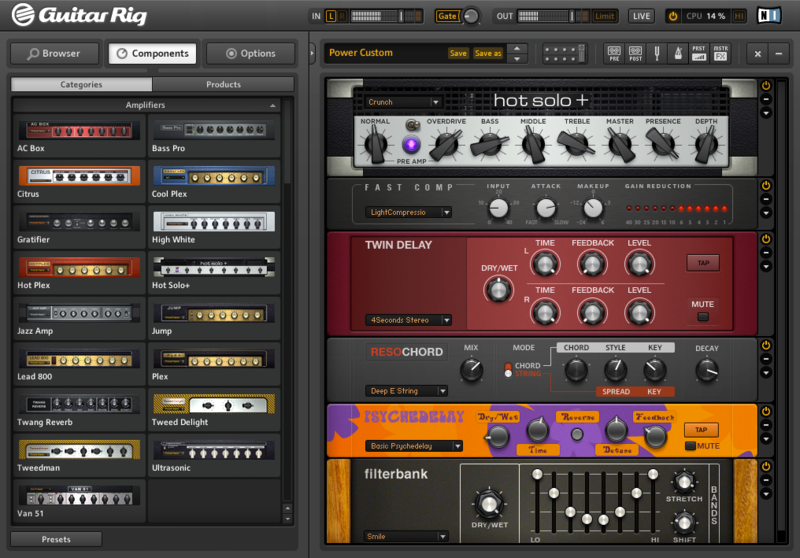 The program is even able to host VST plug-ins, which opens much wider horizons compared with the rest. In brief, this is clearly the most complex amp simulation, but also one of the most powerful when it comes to sound customization and experimentation. Impressive! Amps, mics... And that's it! Softube didn't want their guitar amp simulation to be overburdened with an effects section. They offer a minimalistic guitar setup dedicated to musicians who want to get the feel of a real guitar recording session in a studio. Available in two versions: Vintage (three combo amps + one mic) or Metal (one amp head + three speaker cabinets + two mics), the product limits its settings to the front panel of the amps and the microphone position. And this is all the more effective given that the sound is very authentic and the powerful settings offer plenty of versatility. 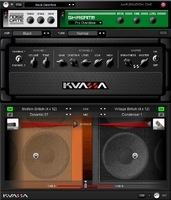 With a simple philosophy (that brings Softube to mind), Kuassa offers two amp simulations – Creme and Vermillon – that provide a breathtaking sound quality considering their ridiculous price. 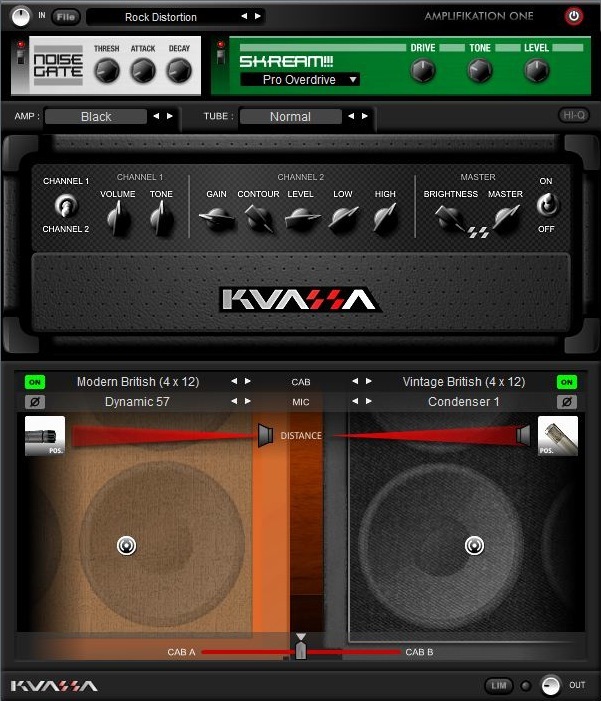 You might also want to check the Kuassa Amplifikation, which is a little more expensive but quite more comprehensive than Creme and Vermillon. It offers the possibility to choose between different amp types and speaker cabinets, as well as to freely place any two microphones among several models. Creme and Vermillon provide eight amp heads, five speaker cabinets and five microphones. You can use two speakers simultaneously and load up to four impulse responses. Last but not least, they include five distortion modules to extend their versatility. 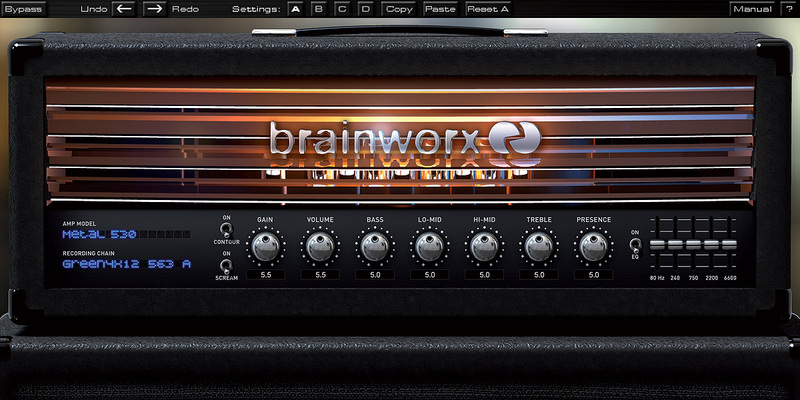 The guys at Brainworx bet on originality with the bx_rocktrack. It focuses on simulating a single amp, a single speaker and a single microphone, but it also aims at recreating the whole recording chain including the room where the amp is recorded and the mic preamps of the mixing desk. This quite interesting concept guarantees the quality of the sound, even if the program may seem very basic compared to others (it offers only six amps and four speakers). Another appealing detail is that you can bypass the components behind the amp in order to feed your own speaker simulation (a Torpedo or any other convolution processor of your choice). Before being appointed by U-He, Sascha Eversmeier earned his reputation thanks to his amazing freeware plug-ins (available at digitalfishphones.com) and his contributions to some of the best effects available in Magix Samplitude (especially Robota, AM-Phibia, AM-Pulse, AM-Track, VariVerb, and the Vandal guitar amp). The originality of this highly ergonomic amp simulation is that it's fully based on modelling technology, thus it offers many more parameters than convolution-based products. Instead of using a closed IR system to reproduce the sound of a mic or a speaker, Sascha decided to emulate every hardware component: speaker, cabinet, room acoustics, and microphones, plus different interactions and resonances. The result: the Vandal speaker simulation sound is never the same, as opposed to the never-changing convolution-based solutions. 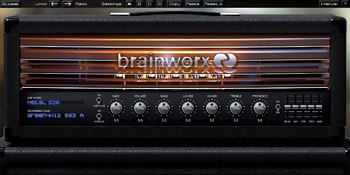 Moreover, it gives you interesting tweaking possibilities, for example, you can put the speaker of a given guitar combo in a bass guitar speaker cabinet... Another uniqueness is that the program offers no real amp simulation. Just good amps that sound good. And that's due to the fact that, just like the speakers, they were modelled component by component. And the best thing is that all this complexity is nowhere to be found in the GUI because the latter is based on a simple rack + stompbox system which is easy to use and edit. It's worth a test! It's time go back to basics with S-Gear. It offers only three amps (a clean amp inspired by Robben Ford, a rock amp inspired by Marshall and a hi-gain amp inspired by Soldano), three effect processors (delay, reverb and modulation), plus a dual speaker and microphone convolution-based simulation. Its appeal? Wonderful and expressive clean and crunch sounds, and a great overall simplicity. It's worth a test! 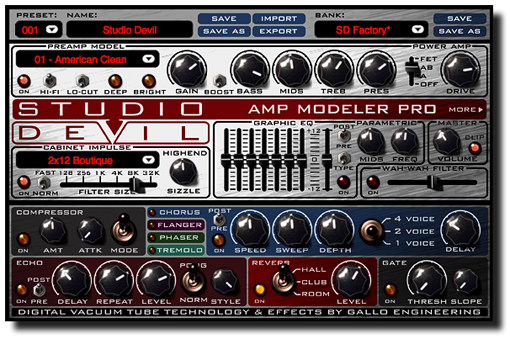 Fans of simplicity will be most interested in Studio Devil's amps. They are very easy to edit thanks to their well thought-out GUI where all necessary controls are in one single window. 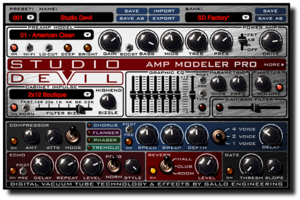 With separate preamp and power amp stages feeding a convolution-based speaker simulation, the Devil Amp Modeler Pro covers many different sound styles.